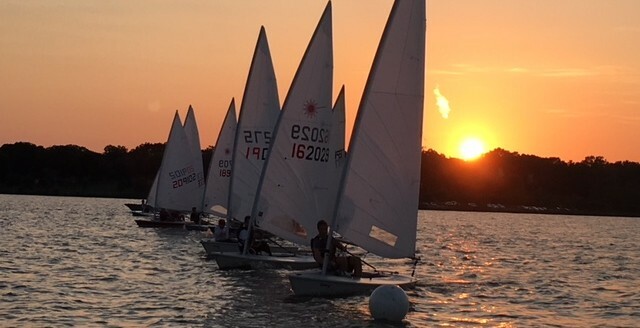 Thirteen boats hit the line last night to enjoy near perfect conditions at the lake. There were 11 full rigs and two radials being sailed exceptionally well by Aubin and Rachel. Winds were fairly steady straight down the pipe from the south. BUT, there were shifts in there, and with courses that had a very long weather leg, it made for good tactical and strategic sailing. Speed was needed, too, and Chris B. had it in spades, giving up a tad of pointing to get to the next shift. He sailed his own races, and he was rewarded with four of five firsts on the evening. Racing in the pack was very close, with some fun mark roundings for the RC to watch. Speaking of RC, we had Alex as PRO who did a good job making the calls on the course. The first race was skewed as a big leftie filled in, but things worked out well after that. He was a bit less stellar on getting participants’ names, so no rundown, but he did a great job running the boat by himself! Afterwards, Griffin, Tim, Chris, Alex, Eric Ro., Greg, John (back for a few hour layover in Dallas), Forest and Mandy, Porter, and Cindy and Brig (with Angel) hit Lake House. The young studs who repped in CO had a lively convo regarding their exploits of being out late and still sailing well later in the day(!). Several Eastern European ladies will be telling stories back home, I am certain…. All in all, a perfect capping of a fun night of sailing. Saturday started with 27 competitors and a breeze that slowly trickled in around 11:00AM out of the southwest. As race 1 started shortly thereafter, it became abundantly clear that the breeze was not going to last, slowly retreating from whence it came. Griffin took advantage of the direction of retreat and took an unfavorable shift to stay in the breeze, sailing twice the distance of his competitors to take a flyer into the weather mark, having gained a substantial lead. The downwind leg would see the wind die completely, with only the powerboat waves propelling the fleet forward. DLF sailors finished 1, 3, and would be 5, but Alex took his shirt off and neglected to put his PFD back on, thus was summarily disqualified. The afternoon saw the breeze shift 180 degrees and fill in to a fresh 10-15 knots for another 3 races seeing Griffin grab two more bullets, Eric a third, and Alex a second. After festivities with the local sailors, encounters with two black bears, and some additional acclimating to the altitude, Dallas was ready for day 2! Day 2 started much the same as Saturday with a dying southwesterly breeze, which gave us two races, the second of which Eric scored a third! We readied up for one last race as the wind predictably shifted 180 degrees and picked up to 10-15 knots. This race was one for the history books!! Griffin started at the pin and Alex at the boat, Griffin played the hard left and Alex played the hard right yet, yet still managed to both meet at the top mark ahead of the fleet with Alex having a 1/2 boat length lead!! Welcome to mountain sailing!! On the downwind leg, Alex picked a fight with a Brit, Griffin played it safe down the middle and Tim found a pocket of breeze that found him passing half a dozen boats. With one last upwind, we had to be sure that Texas left their mark on Colorado and we did with Griffin, Alex, and Tim finishing 1, 2, 3, respectively. Griffin ended up first in the Regatta and exchanged Burgees with the Grand Lake Yacht Club. 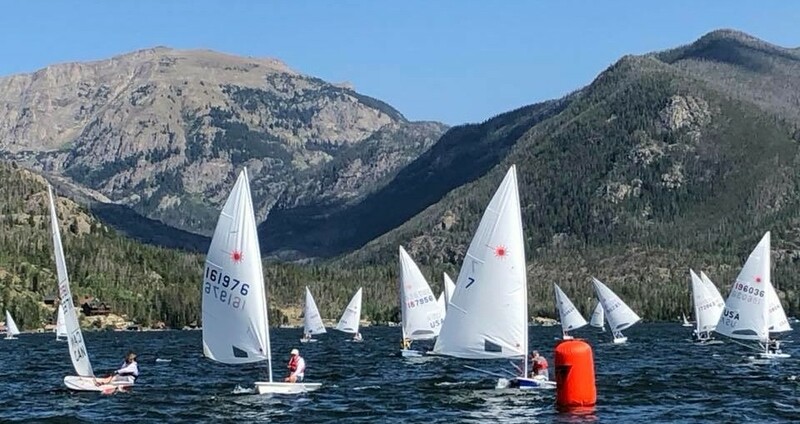 Team Texas pledged to return next year with even more boats and also extended invitations to the Colorado sailors to attend Wurst fest or Rock the Ice Regattas. Overall this was a fantastic regatta that none of us will forget and none of you should miss out on attending next year!! This entry was posted in Uncategorized by wpmonkey. Bookmark the permalink.